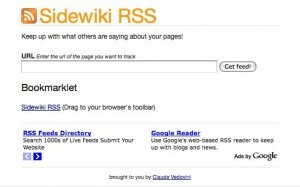 Last week Google announced Google Sidewiki, a new service that enables anyone to comment on any page. There has been a lot of comments already about Sidewiki but the thing that instantly stroke me is the fact that there’s no easy way to keep up with what others are saying about your own pages. So I took a look at the Sidewiki API and built the Sidewiki RSS service. This free service (hope you won’t mind the Google Ads) enables webmasters to get the URL to the recent Sidewiki entries for their pages. There’s even a bookmarklet that you can drop in your browser’s toolbar and use to get the feed of the page you are browsing. This entry was posted in Code & Technology, Others, Projects & Realizations and tagged atom, free, google, rss, sidewiki, sidewikirss on 2009-09-30 by Claude Vedovini.